As you probably already know, the nVIDIA GeForce 8600GTS is a winning horse. nVidia's 'G84' core was released with much fan fair and little over a week later almost every manufacturer had a GeForce 8600GTS card out on the street. What's even more exciting is that the hype seems to be panning out too... this GPU is as good rumours say. Nice. Why is the Geforce 8600GTS such a big deal? It is after all a mainstream GPU, not built blast though games like a howitzer, and not bound to break the all time gaming scores either. Instead, what videocards like the Foxconn 8600GTS-256 offer us up DirectX 10 and Microsoft Windows Vista compatibility. Previously, the only other card cable of these two points were the expensive Geforce 8800GTS and 8800GTX models. In the PCSTATS test labs we're still seeing spotty game play in Vista, so perhaps just dual boot with WindowsXP for the next little while. When Microsoft, nVIDIA, ATI and game developers sort out running older games on Vista, upgrade then. In the mean time there is a huge list of DirextX 10 games on the horizon to look forward to; Unreal Tournament 3, Crysis and Guild Wars 2 just to name a few. I took a look through the screen shots posted on the developers websites, and I'll tell ya, I can not wait!! I predict that once you go DX10 gaming, you'll never go back. There are many Geforce 8600GTS models to pick from, and to be honest these videocards are virtually all re-branded nVidia reference cards. This is good, it ensures quality and reliability, but it does make standing out a little tougher. The Foxconn 8600GTS-256 is a pretty plane example of what's available, and it is priced nicely too. 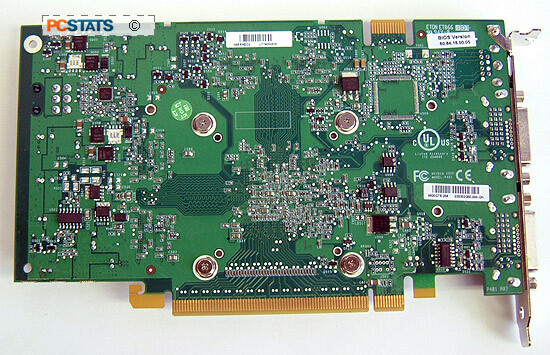 All GeForce 8600GTS-class videocards are PCI Express x16 based. If you still use AGP based motherboard, it's time you overhaul your rig. If that's in your plans, just be sure to pick up a power supply that's up to snuff, with a 6-pin videocard power connector if possible. 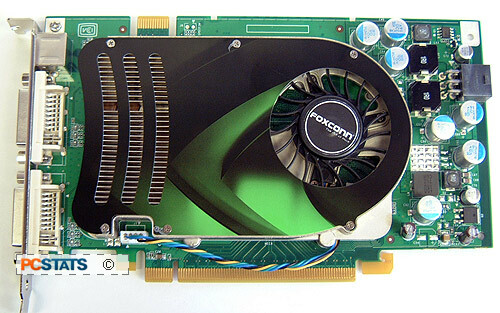 The Foxconn 8600GTS-256 is an exact copy of the reference nVIDIA card down to the heatsink. In its current configuration the 8600GTS-256 is a single slot solution, although you'll want to keep the expansion slot adjacent to the videocard free so it gets a nice steady stream of cool air. 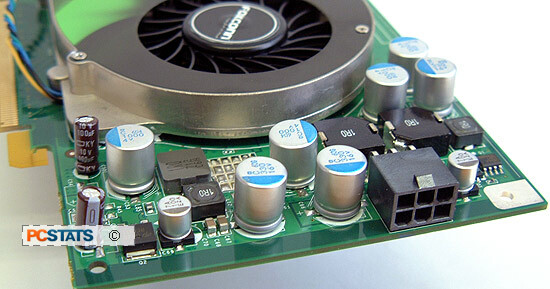 The heatsink fan is PWM compliant and is temperature responsive. We were pleasantly surprised by the quietness of the videocard fan throughout our tests with it. However, if you do choose to slap on a nice after market Arctic Cooling unit, or perhaps a custom water block, you'll find the heatsink is easily removed by loosening four screws around the 8600GTS GPU. I like to think that all videocards should come with some bundled game titles, I mean if this is your first card what are you going to break it in with? For reasons that escape our logic, Foxconn proudly includes the hard drive applications VirtualDrive 10 and RestoreIT 7.0 software. It's an odd mix if you ask me.